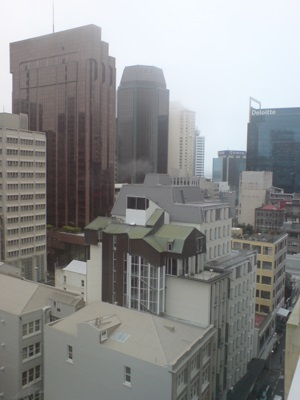 Located on the North Island of New Zealand, Auckland is the largest city in the country. As of 2006, the census indicated the city had a population of 404,658. A large number of people also live in the metropolitan area surrounding Auckland, and as of 2007, the combined city/metropolitan population was estimated at 1,329,900, which is over a quarter of the New Zealand's entire population. The central area of Auckland occupies a narrow isthmus, less than 1.2 miles (2 kilometers) wide at its narrowest point, that lies betwen Manukau Harbour on the Tasman Sea, and Waitemata Harbour on the Pacific Ocean. Consequently, the city one of only a handful in the world to have harbors on two separate bodies of water. Both of these harbors are partially crossed by bridges - the most spectacular of these bridges is Auckland Harbour Bridge which crosses Waitemata Harbour, just to the West of the Auckland Central Business District. The tallest and most recognizable building in Auckland is the Sky Tower. This is an observation and telecommunications tower located in the city's business district. The tower, which attracts approximately 600,000 visitors each year, stands 1,066 feet (328 meters) tall, making it the tallest free standing structure in the Southern hemisphere. Visitors who go up the tower can enjoy two restaurant levels (one with revolving seating), one cafe level, and two observation decks, one of which has some glass sections in the floor. If that's not enough of a thrill, you can try the "SkyJump" from the observation deck - this is a 624 foot (192 meter) cable-guided "jump" from the observation deck, which is sort of intermediate between a bungee jump and a base jump. Planning your trip to Auckland requires a lot of research and time spent on the web, looking on where to stay, best things to do, where to eat, what to see, and what tours to book. That’s why we built a simple 3-days guide to Auckland, with all you need to know before you go. Get this guide and gain access to online maps with the best spots, reviews of recommended hotels and restaurants, a daily plan from the morning until the evening with exact things to do each hour, tips about where to go out in the night and useful local information. This guide is not the encyclopedia of Auckland. We do not just list all the available hotels, restaurants, sights and tours as this would not provide a valuable service to you. It is a compact, short and sweet travel guide that will help you save time from planning and enjoy your travel time more. - Exact information on what is the best hotel to stay in Auckland, so that you will be in the best area of Auckland for all activities, without breaking the bank. - Exact information on what to do every hour of the day. - The best sights: Discover the top sights in Auckland. - Where to Eat: What are the best restaurants that locals go to. - What dishes to try. A simple culinary guide with the top 10 dishes and drinks. - Where to go out in the evening. Only the top suggestion for each day for one bar or a club. - How to move from the airport to the hotel with the most budget friendly way. - What museums and sights to see. What tourist traps to avoid. - Where to Book Everything Online, to save time and money. - Best things to do in each one of the 3 days. - All the Maps are available in Google Maps, to help you navigate Auckland easy, through your smartphone. Get this Guide Now and enjoy your trip to Auckland! About Guidora: Guidora is a startup that solves the problem of "What exactly to do in a destination in +72 hours". Guidora provides well-researched travel itineraries, written by local experts and local guides. Guidora operates an online travel itinerary marketplace at http://www.guidora.com and holds a popular blog on travel related subjects. We are small which makes us even greater :) We have put in the most special landmarks in Auckland and surrounding, such as islands to visit and the best beaches. This guide is perfect for you if you want to explore Auckland and find your way around..
Lonely Planet’s New Zealand’s North Island is your passport to the most relevant, up-to-date advice on what to see and skip, and what hidden discoveries await you. Glide through turquoise waters past pods of orcas in Bay of Islands; try black-water rafting in astonishing Waitomo Caves; and sample craft beer and check out the arts scene in cool little Wellington. All with your trusted travel companion. Get to the heart of New Zealand’s North Island and begin your journey now! The Perfect Choice: Lonely Planet’s New Zealand’s North Island is our most comprehensive guide to the North Island, and is perfect for discovering both popular and offbeat experiences. Looking for wider coverage? Check out Lonely Planet’s New Zealand for a comprehensive look at all the country has to offer. About Lonely Planet: Lonely Planet is a leading travel media company and the world’s number one travel guidebook brand, providing both inspiring and trustworthy information for every kind of traveller since 1973. Over the past four decades, we’ve printed over 145 million guidebooks and grown a dedicated, passionate global community of travellers. You’ll also find our content online, and in mobile apps, video, 14 languages, nine international magazines, armchair and lifestyle books, ebooks, and more. Lonely Planet’s New Zealand is your passport to the most relevant, up-to-date advice on what to see and skip, and what hidden discoveries await you. Glide through turquoise waters past pods of orcas in Bay of Islands; try black-water rafting in astonishing Waitomo Caves; watch the ground breathe steam in volcanic Rotorua; and hit the slopes in Queenstown and Wanaka – all with your trusted travel companion. Get to the heart of New Zealand and begin your journey now! The Perfect Choice: Lonely Planet’s New Zealand is our most comprehensive guide to the country, and is designed to immerse you in the culture and help you discover the best sights and get off the beaten track. Looking for more extensive coverage? Check out Lonely Planet’s New Zealand’s North Island or New Zealand’s South Island for a comprehensive look at all the country has to offer. Important Notice: The digital edition of this book may not contain all of the images found in the physical edition. Greater Than a Tourist- Aukland New Zeland by Changali Anand offers the inside scoop on Aukland. Most travel books tell you how to travel like a tourist. Although there is nothing wrong with that, as part of the Greater Than a Tourist series, this book will give you travel tips from someone who has lived at your next travel destination. Discover the freedom of open roads with Lonely Planet Auckland & the Bay of Island's Road Trips, your passport to uniquely encountering Auckland and the Bay of Islands by car, featuring four amazing road trips, plus up-to-date advice on the destinations you'll visit along the way. Escape to Waiheke Island or visit the Coromandel Peninsulaeek with your trusted travel companion. Get there, rent a car, and hit the road! The Perfect Choice: Lonely Planet Auckland & the Bay of Islands Road Trips is perfect for exploring Auckland and its surrounding areas via the road, discovering sights that are more accessible by car. Looking for more extensive road trip routes? Lonely Planet New Zealand's Best Trips has over 30 road trips to truly get to the heart of the country. Planning a New Zealand trip sans a car? Lonely Planet New Zealand, our most comprehensive guide to New Zealand, is perfect for exploring both top sights and lesser-known gems. Looking for a guide for New Zealand's South Island or North Island? Check out Lonely Planet's New Zealand's South Island guide or New Zealand's North Island guide for a comprehensive look at what each island has to offer. About Lonely Planet: Since 1973, Lonely Planet has become the world's leading travel media company with guidebooks to every destination, an award-winning website, mobile and digital travel products, and a dedicated traveller community. Lonely Planet covers must-see spots but also enables curious travelers to get off beaten paths to understand more of the culture of the places in which they find themselves. The guide that shows you what other travel books only tell you! New Zealand is one of the most spectacular and least spoiled countries on the planet and DK's Eyewitness Travel Guide: New Zealand guide does full justice to its astonishing volcanic landscape, wildlife reserves and fjord-like coastline. More than 1,100 full-color photographs, detailed street-by-street maps, and listings of all major attractions help provide endless fun for any vacation. Whether visiting the capital city of Wellington, the panoramic views of Auckland, or the smaller enclaves on the North and South Island, there is plenty to see when traveling to this rich and vibrant landscape. DK's guide gives extensive treatment of the fascinating Maori culture and art as well as solid information on outdoor activities, New Zealand's fine wines and innovative Pacific Rim cuisine. Brand: Periplus Editions (HK) ltd.
Are you planning your next vacation abroad and you’re ready to explore? Do you want to be prepared for everything? Are you ready to experience every new place you visit just like a local? Well, with this amazing Auckland (New Zealand) travel map you’re all set and ready to go! The Auckland (New Zealand) map was carefully designed to give you amazing results and make traveling easier than ever. We make sure to constantly update our info to give you the most relevant and accurate information, so you will never get confused or frustrated during your Auckland (New Zealand) trip. The map is very detailed and it will not only give you all the available roads and routes, but also the essential information to make your Auckland (New Zealand) vacation unforgettable. In the Auckland (New Zealand) map you will also find the best places to go shopping, the most famous and must-see sights, churches and more. This book was written by and for the traveling nerd. Wander through the streets of Sydney or fly through the air on a zipline in Rotorua, all while seeing the world through the eyes of an engineer. While not overly-technical, this book includes geeky trivia and behind-the-scenes views of places that can only be truly appreciated by those with a love of valves and algorithms!